How Did Strom Thurmond Last Through His 24-Hour Filibuster? : The Two-Way In 1957, Sen. Strom Thurmond prepared for his filibuster against civil rights legislation with steam baths — to become dehydrated so he wouldn't need a bathroom break. He got at least one chance to relieve himself, however. This week, Sen. Rand Paul gave up when nature's call became too urgent. "I would try to go another 12 hours and try to break Strom Thurmond's record, but there are some limits to filibustering and I am going to have to go take care of one of those here," he said. The record-long filibuster is the 1957 talkfest by then-Democratic Sen. Strom Thurmond of South Carolina. He lasted for 24 hours, 18 minutes. 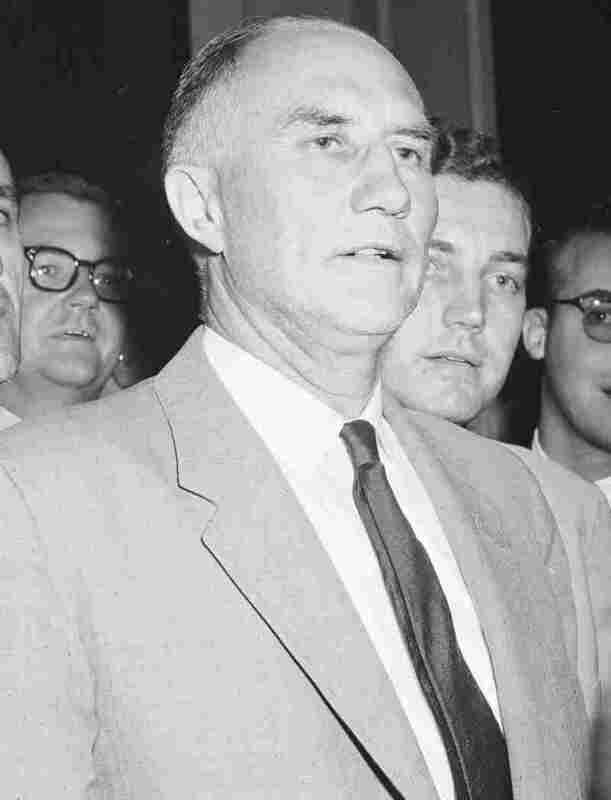 Sen. Strom Thurmond of South Carolina after his 24+ hour filibuster in 1957. He was a Democrat then. Later, Thurmond would switch to the Republican Party. A piece by Vanity Fair today led us to two accounts that explain how he made it through that marathon attempt to block civil rights legislation. -- The Village Voice notes that: "As Jack Bass and Marilyn W. Thompson describe the situation in their book Ol' Strom, even though the bill was pretty much defanged, Thurmond was still hell-bent on fighting it. Southern Democrats agreed not to run an organized filibuster; they left it up to individual members to take up the battle. Thurmond decided to fight on alone, and to prepare himself, he took steam baths every day to dehydrate his body so it could absorb fluids without his having to leave the Senate chamber for the bathroom." -- And Time magazine wrote shortly after the filibuster that after Thurmond had been speaking for about three hours: "Arizona Republican Barry Goldwater approached Thurmond's desk, asked in a whisper how much longer Strom would last. Back came the answer: 'About another hour.' Goldwater asked that Thurmond temporarily yield the floor to him for an insertion in the Congressional Record. Thurmond happily consented — and used the few minute interim to head for the bathroom (for the only time during his speech). he returned and began talking again. His promised hour passed; Strom spoke on." If Thurmond had needed to relieve himself again, the Village Voice says his staff had come up with a solution: "Aides tried to avoid defeat by the toilet by setting up a bucket in the cloakroom where Thurmond could pee, keeping one foot on the Senate floor while doing so." Time adds that during the filibuster "Thurmond mumbled on, sipping orange juice sportingly brought to him by Illinois' liberal Paul Douglas, munching diced pumpernickel and bits of cooked hamburger." There is an argument to be made, Constitution Daily says, that Thurmond isn't the true record holder. In 1953, Oregon Sen. Wayne Morse (then a Republican) lasted 22 hours, 26 minutes — and reportedly did not get a bathroom break.